Stylish and lively living spaces always attract the attention of others; and get you praise from all. Here are some simple do-it-yourself tips for home interiors collected from various sources, to perk up the decor in your home and brighten your home interiors. Painting the walls: Gone are the days when whole of the house got painted in just one color; now you can color any wall of the room in your favorite color and decorate it with the artifacts of your choice. While doing this, one point should be kept in mind that other accessories in the room should match the color of the wall. 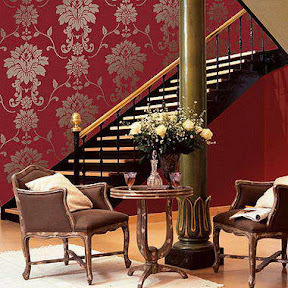 Use of trendy wallpapers available in the market also gives a uniqueness to the room, and it also serves to protect the paint for a longer time. Rearrange furniture: Keep changing different pieces of your furniture from time to time, which brings a variety in the decor element. A sofa arranged diagonally across a narrow living room will make the room look wider. You can put some ‘mudhas’ or low stools available at cheap rates, to give an ethnic look to the decor. Plant greens: If you can’t afford to have a home with garden, introduce some greenery in your home by adding some indoor plants. These plants will add a breath of fresh air to any room. Hanging plants in the terrace also give a trendy look to your decor. Hang pictures or mirrors: Hang old family pictures in ornate frames on a wall that looks in contrast to the color scheme of the pictures. Hang mirrors of different sizes and shapes to give an illusion of space to the room. Position a mirror in a way that it reflects a scenic view of the outdoors. Place cushions: Buy two or three sets of cushions which are available at cheap rates. Place them alternately on the sofa to give variety and add textures and patterns to the room. Spread a carpet: Place a carpet matching the color scheme of the room, under the center table, or just throw it at an angle that gives an intriguing appeal. Group figurines: Place the interesting artifacts, like different poses of laughing Buddha, glass pieces or any other such figurines, in a common display area, and keep changing the shapes from time to time. Replace lighting: Add a little glamor to the lighting scheme of your house. Change the old lampshades and tube lights of your house and add some new and exotic looking shades to liven up the room. Different types of shades made from seashells, rice-paper, jute and terracotta can be tried for a change.